What colours is the travel system available in? Both the Double Trouble Twin and Single Prams are currently only available in black. Up until what age/weight can I use the Maxi-Cosi Group 0 infant car seat? The Cabriofix, Pebble and PebblePlus can be used from birth to 13kg which is approximately 10 – 12 months. What is the maximum weight the toddler pram seat can hold? Can the toddler pram seat recline flat? Single Pram – The toddler pram seat can recline into a flat position when the toddler seat is in both the forwards and rearward facing positions. Twin Pram – The toddler seat that is closest to the front wheels have a three position recline with upright being the first position. The toddler seat closest to the handlebar has a two position recline with upright being the first position. This seat can therefore not recline completely flat. Is the pram toddler seat reversible? Yes, the toddler seats can face forwards and rearwards. When can I use the toddler pram seat? Can I go for a jog with the pram? The prams will handle a fast walk or slow jog. Please be advised that this is not a full jogging pram so care will need to be taken. Does it come with the car seat adaptors or do I need to buy them separately? The car seat adapters are included so no additional cost. Can the Single Pram be converted into a Twin pram if I have another baby? No, it cannot be converted. Can I remove the pram toddler seat cover to clean? Yes, all the covers can be zipped off and hand washed. How small is the frame when folded? Does it come with a cup holder? Single Pram – Yes, it comes standard with a cup holder. Twin Pram – No, it does not come with a cup holder. I live on a farm, can the pram handle uneven terrain? Yes, the prams have suspension and can handle uneven terrain. What does the frame weigh? Can I fold the pram with the pram toddler seat/(s) attached? Single Pram – The single pram can fold with the toddler seat facing forwards only. Twin Pram – Both toddler seats will need to be removed in order to fold the twin pram. Do you sell any other accessories with the pram? We have rain covers for the toddler seats available. Do the wheels have tubes or rubber? The wheels are made from a polyurethane rubber and are tubeless limiting the chance of getting a puncture. Is it only compatible with the Maxi-Cosi Cabriofix, Pebble and Pebble Plus or can I use a different car seat? Yes, it is only compatible with the Maxi-Cosi car seats. Do you sell Isofix bases? We currently have two isofix bases available namely the Maxi-Cosi FamilyFix and Maxi-Cosi 2WayFix base. What is the difference between the FamilyFix and 2WayFix bases? Both the bases can accommodate the Cabriofix, Pebble and PebblePlus Group 0 car seats. The difference is in the Group 1 car seat that installs onto the base. The FamilyFix accommodates a Group 1 car seat called the Pearl (9 – 18kg). The Pearl can only be installed facing forwards. The 2WayFix accommodates a Group 1 car seat called the 2WayPearl. This seat can be installed onto the 2WayFix from 6 months in the rearward facing position. The 2WayPearl will be rotated to face forwards at 15 months up to 18kg or 105cm. Is there a Group 1 car seat that can install onto the EasyBase 2 car seat base? No, this base can only be used with the Cabriofix car seat. 2 ISOFIX connectors (metal bars) fit on the anchor points (metal clips) at the base of the vehicle seat. The top tether anchor point is on the boot floor or the back of the seat bench. In most newer cars it’s highlighted with the top tether logo. The top tether hook of the car seat needs to be firmly attached to the hook, to secure the third ISOFIX point. The support leg is on the floor of the car between the back and front seats (when installed on the rear bench) or between the front seat and dashboard (when installed on the passenger seat). To work correctly, the support leg of the car seat should be stable. If you use a support leg, it is very important to check whether the floor of the car has a floor storage compartment. If it has, you must check the car fitting list / instruction manual to see how you can use a support leg in combination with the compartment. 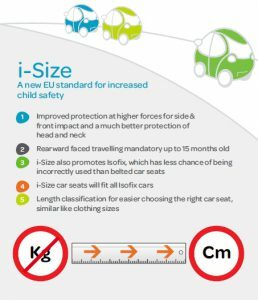 i-Size is a European car seat safety regulation that came into force in July 2013. It’s part of the R129 regulations and applies to new car seats for babies and young children up to around four years old. i-Size was developed using the very latest research into child safety in cars. Why is the first stage car seat rearward facing only? Group 0 car seats are approved according to the latest European safety standard ECE R44/04. This regulation requires that the Group 0 car seat be installed rearward facing to protect a baby from breaking it’s neck should there be a front impact. How do I install the car seat into the car if I don’t have a base? How do I know if my car comes with Isofix? You can check your car user manual or your closest dealer. Some cars will have labels stitched into the rear seats. Can the car seats face each other on the twin pram frame? No, both the car seats will face the parent pushing the pram. How to remove the Cabriofix cover to clean? Does the car seat come with a sun canopy? Yes all the car seats come with an integrated sun canopy. Please see the link below to see how to install it. How to install the Sun Canopy on the Group 0 car seats? Up until what age/weight can I use the carry cot? 9kg which is approximately 6 – 9 months. The carry cots should not be used once an infant becomes mobile. When would I use the carry cot? Carry cots are great to use around the home, if you are out shopping or if you travel a lot. They can also be used as seperate basinetts. Can I lend my single pram carry cot to my friend that has a twin pram? No, the adapters are different. If I want to place an order, what is the process? You can place an order and pay online using the online store. Should you wish to purchase via EFT then please email us on info@double-trouble.co.za, phone or contact us via the enquiry form on the Contact Us page. Send us your full name, delivery address, contact number and the items that you wish to purchase. We will send you a quotation with our banking details. Once payment has been received we will dispatch your products. Do I need to pay for delivery? Double Trouble offers free delivery to all major hubs or major centres. Any other centres (‘Regional Areas’) may be subject to a surcharge. Please contact Double Trouble at info@double-trouble.co.za to request a quotation should you reside in a Regional Area. Should you purchase on the online store the “Request a Quote” will appear. How long will it take to receive my pram? Delivery to major centres takes 3 – 4 working days from day of dispatch. Regional Areas will take an additional 24 – 48 hours. Orders placed and paid for before 12:00 will be dispatched the same day provided all the items are in stock and all the delivery details have been received. Orders placed and paid for after 12:00 will be dispatched the following working day. This is a door to door service. Deliveries will take place between 08:00 – 17:00, weekdays, Monday to Friday only. Deliveries on a Saturday will be subject to a surcharge. A tracking number will be e-mailed to you once the parcel has been couriered. All shipments can be tracked online. Yes, we accept Visa and Mastercard credit and debit cards ONLY. What is the warrantee and do you have spare parts? Please see our warranty document on the Homepage. Do you have spare parts for replacement? Yes, we carry a full range of spare parts. Are we able to view the prams anywhere? Double Trouble is mainly an online site however the prams are available for demonstration in Parklands, Cape Town. Please note that these demonstrations are by appointment only. Do you supply to any retailers? No, we are the sole importer and retailer of the Double Trouble products and have not started distributing yet.